Marinate-All-Day Low-Carb Greek Lemon Chicken marinates all day while you’re at work, and when you get home dinner is ready to go in the oven! This Greek Lemon Chicken is absolutely delicious and it’s also low-carb, Keto, low-glycemic, gluten-free, dairy-free, Paleo, and Whole 30! Use the Diet-Type Index to find more recipes like this one. Click to PIN Marinate-All-Day Low-Carb Greek Lemon Chicken! Marinate-All-Day Low-Carb Greek Lemon Chicken! There’s a post on this blog with Six Low-Carb Dinner Menus for Valentine’s Day, and that has tasty options that I think might be a hit for a Valentine’s Day dinner! 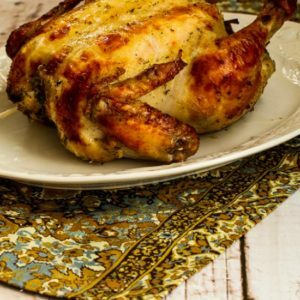 But I today I’m also reminding you about this delicious Marinate-All-Day Low-Carb Greek Lemon Chicken that sounds perfect if you’re looking for a Valentine’s Day Dinner to make after work, and this easy recipe will be a winner with anyone who likes the flavors of Greek Lemon Chicken! 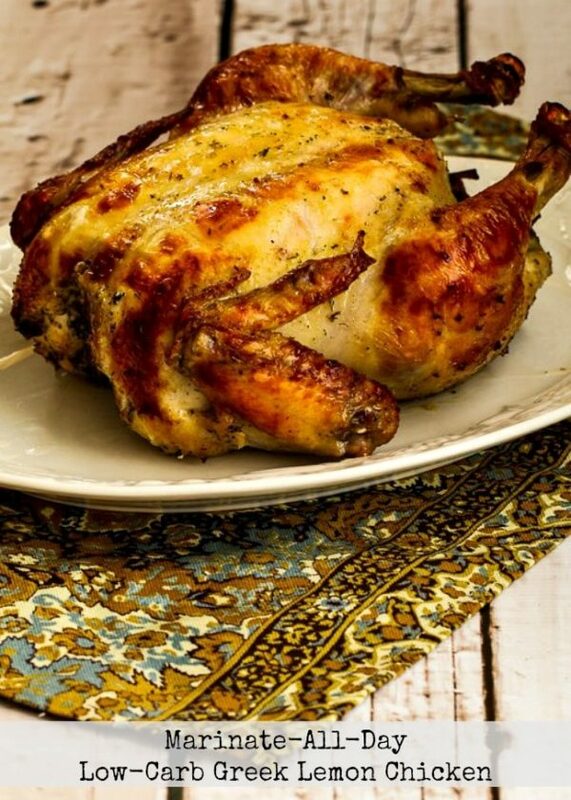 I don’t know how many people still roast chicken at home now that it’s so inexpensive to just grab a rotisserie chicken at the store, but I promise that not only is this chicken delicious, but the wonderful smell that fills your house while the chicken is roasting makes it worth the little bit of extra effort. Greek Lemon Chicken marinates all day in a plastic bag in a mixture of lemon juice, olive oil, and Greek spices, and in the evening you just pop it in the oven for an easy dinner in about an hour. Mix the fresh lemon juice, lemon zest, Greek seasoning, olive oil, salt, and pepper to make the marinade. Tying the chicken is optional, but I like to do it. 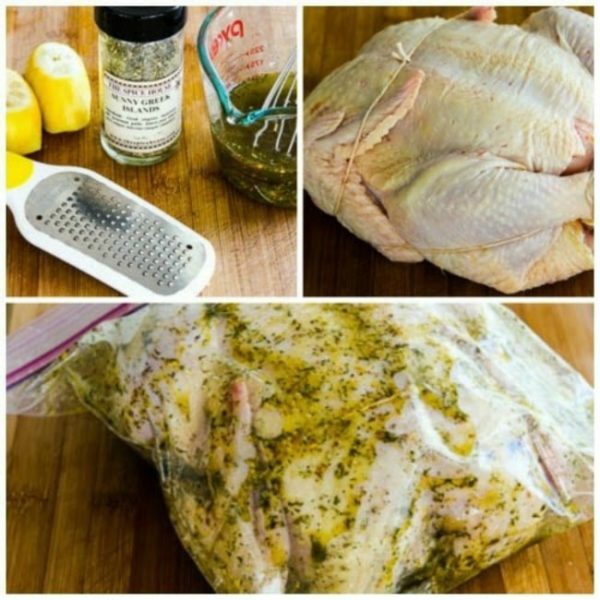 Put the chicken in a plastic bag with the marinade and let it marinate all day in the fridge. 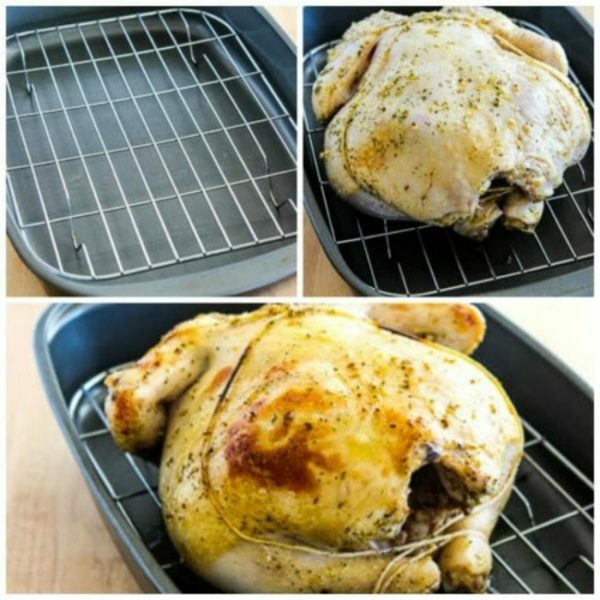 I rig up a roasting pan by putting a rack inside a baking dish, which lets the hot air circulate under the chicken, but you can roast it just on a baking sheet as well. Start the chicken with breast side down and cook at 450F/220C for 25 minutes. Then turn the chicken over, lower the heat to 350F/180C and cook 35-45 minutes more. (I use an Instant-Read Meat Thermometer to cook until the chicken reaches 170F.) You can broil the chicken for a couple of minutes if you’d like to brown the top a bit more, but even if you skip that step, this chicken is pretty photogenic! Make it a Meal: This would taste great with Cauliflower Rice with Basil, Parmesan, and Pine Nuts, Slow Roasted Asparagus (which can cook at the same time as the chicken), or Mary’s Perfect Salad Dressing on spring lettuce mix for a low-carb meal. 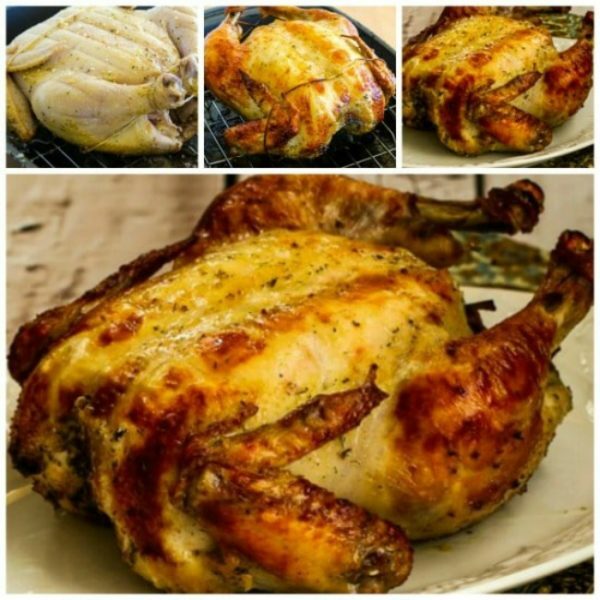 Roasted chicken is great left over, so this recipe has been added to a new category called Weekend Food Prep to help you find recipes you can prep or cook on the weekend and eat during the week! This Greek Lemon Chicken is absolutely delicious and marinates all day while you’re at work. I usually tie the chicken with string, but you don’t have to. Mix marinade ingredients in measuring cup. Put chicken in large Ziploc bag, pour marinade over, then zip bag shut and mix well, until chicken is well coated. Put in fridge all day while you’re at work. Roast about 25 minutes, then turn breast side up and baste with pan juices. Lower heat to 350 and roast about another 35-45 minutes, or until top is browned and Instant-Read Meat Thermometer reads about 170. It takes about an hour and 15 minutes for a 5 pound chicken. You could use fresh-frozen lemon juice for this recipe. 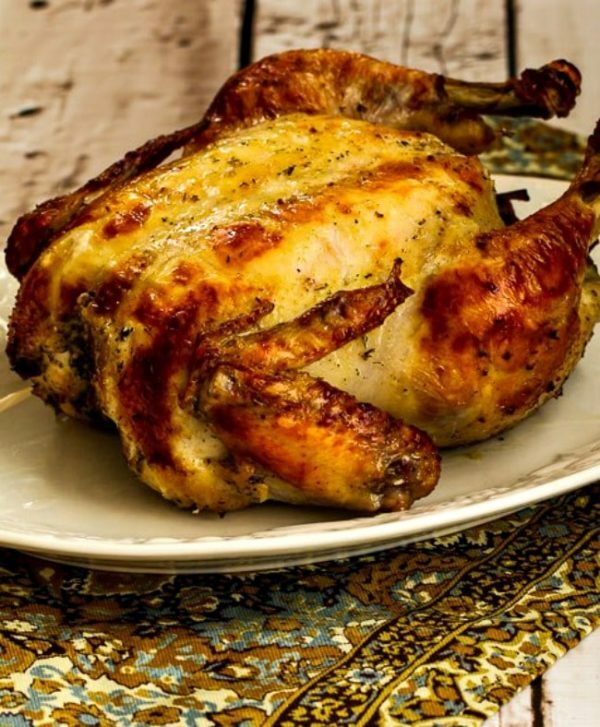 Greek Lemon Chicken would be a great dish for the South Beach Diet, and low-carb eating plans, even Keto. Those who are South Beach Dieters who are following the letter of the law should should let other family members have the legs and thighs and eat the breast meat, which has less saturated fat.